Why do we need a consultant? Home » FAQs » Why do we need a consultant? When investing money in an enterprise management system, it is important to protect that investment and ensure user acceptance. A Microsoft Office SharePoint consultant can help you find the right solution for your business. Then, the consultant will work with you to implement the new system through appropriate training and data migration. Microsoft Office SharePoint Server is an enterprise information portal that improves a company’s efficiency and effectiveness through better content management, enterprise search, and sharing of files and information. 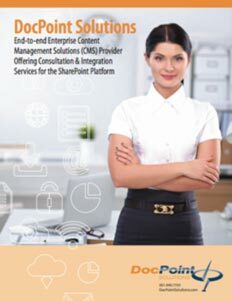 SharePoint’s single integrated platform supports Intranet, Internet and Extranet without replacing existing sites. What approach does DocPoint Solutions take for project management? How does SharePoint add value to an organization? Using SharePoint 2010 or 2013 can help solve business problems and increase productivity. Consider the following scenarios. Are spreadsheets being emailed around, but no one knows which version represents the latest copy or what comments have been added? Do employees in different time zones need to collaborate on one document or project but allowing easy access to the appropriate material by the right people is difficult? SharePoint can address both of these issues – and many more. Aligning your SharePoint strategy and your business’ strategic goals makes it possible to bring in more revenue – a tangible result that shows on the financial bottom line of your organization. SharePoint can help reduce the number of technologies organizations need, depending on how business requirements match the functionality that SharePoint 2010 or 2013 offers. Reducing the number of systems can have a financial impact across many areas. What is new in SharePoint 2013? In SharePoint 2013, Microsoft builds on the successes of its previous SharePoint releases and focuses on business intelligence, the mobile experience and the ability to create public-facing websites. Delving deeper into the technical improvements, you can expect to see enhancements to the Business Data Connectivity (BDC) connection – such as support for OData along with Self Contained Applications for SharePoint. eDiscovery is big with SharePoint Server 2013, and much-needed improvements include the eDiscovery Center, where users can access cases to search, hold and export content. Microsoft also enhanced social computing, likely due to the recent acquisition of Yammer. In conjunction the addition of the SharePoint 2013 Community Sites and the Community Portal, Microsoft is well on track for moving forward in this important area. I need to upgrade my SharePoint environment, can you help? This request is the most common one DocPoint Solutions receives. Yes, we certainly can help. We have an extensive track record of successfully upgrading from SharePoint 2003 or SharePoint 2007 to SharePoint 2010 and to SharePoint 2013. 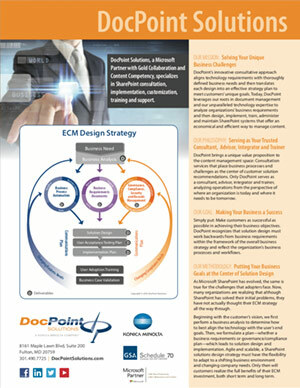 Many services differentiate DocPoint Solutions. For instance, we work with your team to identify the “active” content in your existing environment that must be migrated to the new environment. In so doing, we save valuable time – and space – by not migrating content that does not need to be readily available. Plus, we offer guidance and assistance on how to divide content when migrating to a new environment. 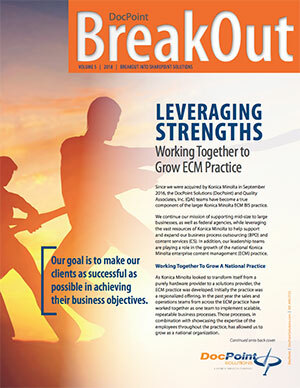 Such attention to Microsoft’s best practices increases performance and content availability. What does DocPoint Solutions offer that I can’t find elsewhere? As a subsidiary of Quality Associates, Inc. (QAI), DocPoint Solutions leverages the resources, experience and expertise of the industry leader in document management and archiving. We’re in business to help you run your mid-Atlantic region (Maryland, Pennsylvania, New Jersey, Virginia and Delaware) business more efficiently and effectively. Our consultants work with you at every step to ensure a seamless transition to your new Microsoft SharePoint system. We also provide post-implementation training and support, so you’ll always have an expert resource to turn to. 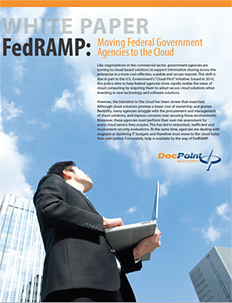 In addition, DocPoint’s status as a U.S. General Services Administration (GSA) Federal Supply Service (FSS) contract holder often translates to quicker, easier approvals for government agencies – so you can get your project approved and started when you need it. Why should we work with a GSA FSS contract vendor? GSA, through FSS, negotiates and awards long-term contracts that allow businesses to purchase products and services directly from commercial suppliers. Vendors that possess GSA FSS contract vendor status offer fair, competitive pricing and excellent service.